Download "PRESS RELEASE. UN Climate Change Conference in Doha kicks off with calls to implement agreed decisions, stick to agreed tasks and timetable"
1 For use of the media only PRESS RELEASE UN Climate Change Conference in Doha kicks off with calls to implement agreed decisions, stick to agreed tasks and timetable (Doha, 26 November 2012) The UN Climate Change Conference in Doha began today with calls for governments to focus on essential tasks ahead of them so that the meeting can deliver agreed outcomes and constitute another step forward in the global response to climate change. The newly elected President of the Conference of the Parties (COP 18/CMP 8), H. E. Mr. Abdullah bin Hamad Al-Attiyah, Chairman of Qatar s Administrative Control and Transparency Authority, urged the conference to stick to agreed timetables and speedily implement already agreed decisions. Climate change is a common challenge for humanity. We must work in earnest for a better future for present and for future generations. We have a precious opportunity over the coming days, and we must make full use of it. Many delegates have stressed the importance of finalizing work on time, and that requires that we all show flexibility, he said. Christiana Figueres, Executive Secretary of the UN Framework Convention on Climate Change (UNFCCC), highlighted an important set of reports published shortly before Doha, which all point to the urgency to act to keep global average temperatures from rising beyond an internationally agreed level of 2 degrees Celsius degrees centigrade, beyond which climate impacts become extremely serious. Analysis published by the World Bank shows the world remains firmly at risk of seeing temperatures rise towards 4 degrees Celsius by the end of the century, creating devastating effects, if current levels of ambition to curb greenhouse gas emissions are not raised. The World Meteorological Organization says greenhouse gas concentrations in the atmosphere have reached yet another record high at parts per million, with no identified change in the upwards trend. The UN Environment Programme (UNEP) warns that the gap between what is needed in terms of emission reductions to stay below 2 degrees Celsius and what is so far promised by countries is still widening, not decreasing. However, all reports underline that the technology, the funding and the policy options to remain below the 2 degrees Celsius goal are already available, provided that governments and societies take the necessary action rapidly enough. 2 Page 2 Expert analysis consistently says that we do have the possibility to keep on track and that to act now is safer and much less costly than to delay. In the last three years, policy and action towards a sustainable, clean energy future has been growing faster than ever. But the door is closing fast because the pace and scale of action is simply not yet enough. So Doha must deliver its part in the longer-term solution, the UN s top climate change official Christiana Figueres said. Governments have said they intend to work hard to advance their decision texts before the high-level segment, so they can hand over a very limited set of options to ministers and close successfully at the end of next week, she said. 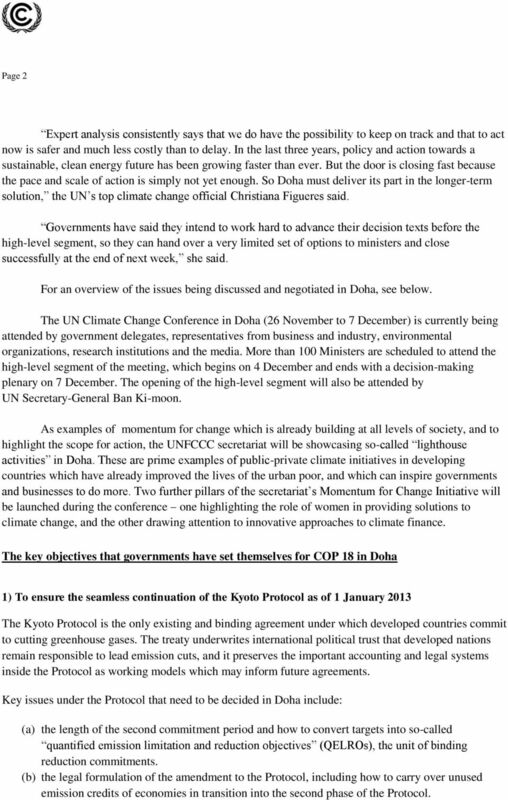 For an overview of the issues being discussed and negotiated in Doha, see below. 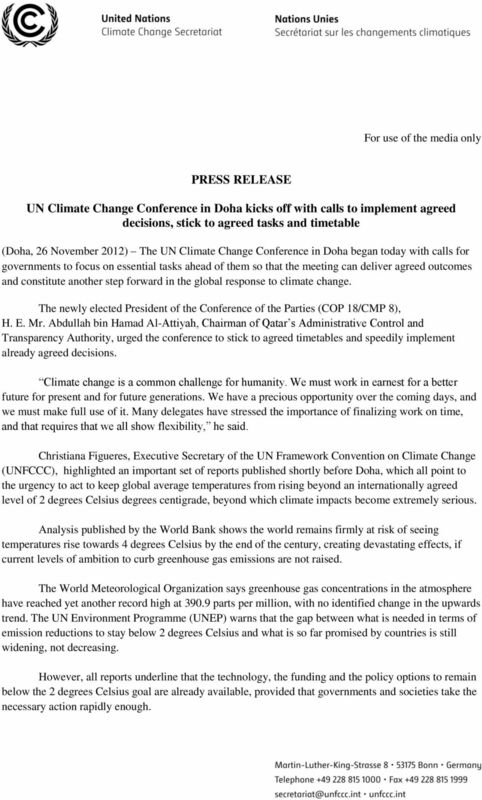 The UN Climate Change Conference in Doha (26 November to 7 December) is currently being attended by government delegates, representatives from business and industry, environmental organizations, research institutions and the media. More than 100 Ministers are scheduled to attend the high-level segment of the meeting, which begins on 4 December and ends with a decision-making plenary on 7 December. The opening of the high-level segment will also be attended by UN Secretary-General Ban Ki-moon. As examples of momentum for change which is already building at all levels of society, and to highlight the scope for action, the UNFCCC secretariat will be showcasing so-called lighthouse activities in Doha. These are prime examples of public-private climate initiatives in developing countries which have already improved the lives of the urban poor, and which can inspire governments and businesses to do more. Two further pillars of the secretariat s Momentum for Change Initiative will be launched during the conference one highlighting the role of women in providing solutions to climate change, and the other drawing attention to innovative approaches to climate finance. 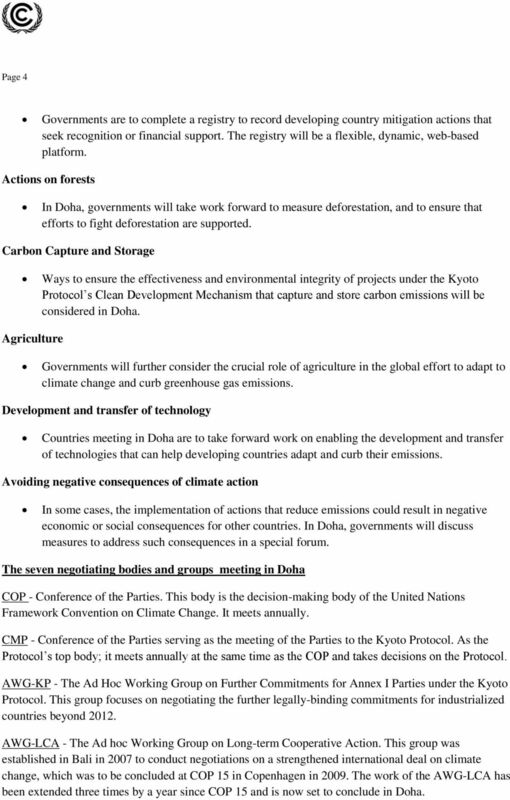 The key objectives that governments have set themselves for COP 18 in Doha 1) To ensure the seamless continuation of the Kyoto Protocol as of 1 January 2013 The Kyoto Protocol is the only existing and binding agreement under which developed countries commit to cutting greenhouse gases. The treaty underwrites international political trust that developed nations remain responsible to lead emission cuts, and it preserves the important accounting and legal systems inside the Protocol as working models which may inform future agreements. Key issues under the Protocol that need to be decided in Doha include: (a) the length of the second commitment period and how to convert targets into so-called quantified emission limitation and reduction objectives (QELROs), the unit of binding reduction commitments. (b) the legal formulation of the amendment to the Protocol, including how to carry over unused emission credits of economies in transition into the second phase of the Protocol. 4 Page 4 Governments are to complete a registry to record developing country mitigation actions that seek recognition or financial support. The registry will be a flexible, dynamic, web-based platform. Actions on forests In Doha, governments will take work forward to measure deforestation, and to ensure that efforts to fight deforestation are supported. Carbon Capture and Storage Ways to ensure the effectiveness and environmental integrity of projects under the Kyoto Protocol s Clean Development Mechanism that capture and store carbon emissions will be considered in Doha. Agriculture Governments will further consider the crucial role of agriculture in the global effort to adapt to climate change and curb greenhouse gas emissions. Development and transfer of technology Countries meeting in Doha are to take forward work on enabling the development and transfer of technologies that can help developing countries adapt and curb their emissions. Avoiding negative consequences of climate action In some cases, the implementation of actions that reduce emissions could result in negative economic or social consequences for other countries. In Doha, governments will discuss measures to address such consequences in a special forum. The seven negotiating bodies and groups meeting in Doha COP - Conference of the Parties. This body is the decision-making body of the United Nations Framework Convention on Climate Change. It meets annually. CMP - Conference of the Parties serving as the meeting of the Parties to the Kyoto Protocol. As the Protocol s top body; it meets annually at the same time as the COP and takes decisions on the Protocol. AWG-KP - The Ad Hoc Working Group on Further Commitments for Annex I Parties under the Kyoto Protocol. This group focuses on negotiating the further legally-binding commitments for industrialized countries beyond AWG-LCA - The Ad hoc Working Group on Long-term Cooperative Action. This group was established in Bali in 2007 to conduct negotiations on a strengthened international deal on climate change, which was to be concluded at COP 15 in Copenhagen in The work of the AWG-LCA has been extended three times by a year since COP 15 and is now set to conclude in Doha. Are you having difficulties displaying the newsletter? Click here. 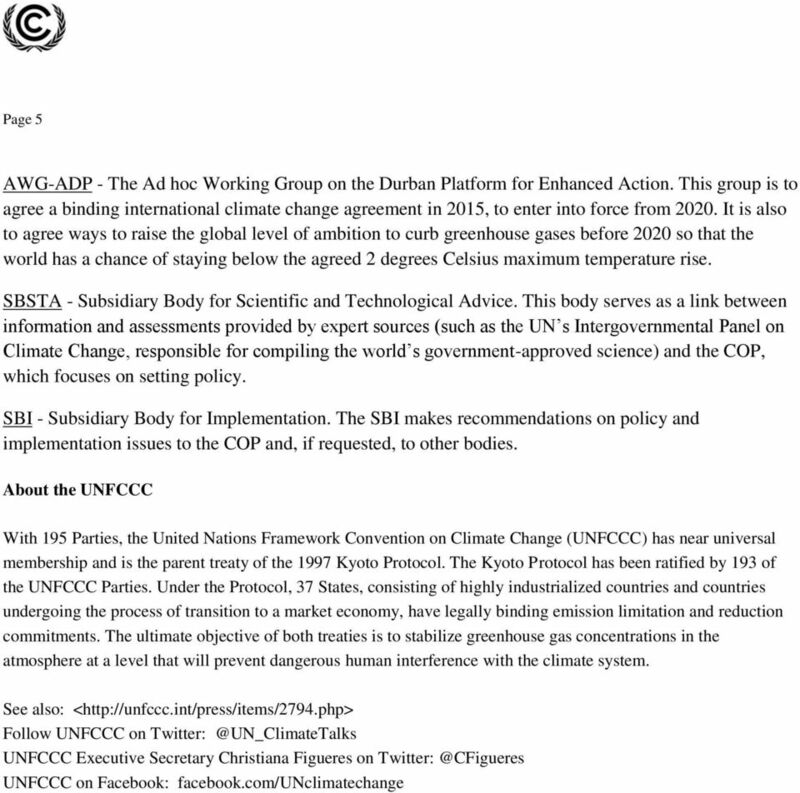 KEY UNFCCC STATEMENTS GUEST COLUMN OTHER UN CLIMATE NEWS DID YOU KNOW? Why are developing countries exempt from the emissions targets? From Paris to Marrakech and beyond: What next for climate policy in the Western Balkans? Climate change is a global challenge that can only be addressed effectively through a global effort. Speech to be given at the High Level Event of Ministers of Finance on Climate Change, session 5: From Kyoto to Copenhagen, Warsaw, 9.